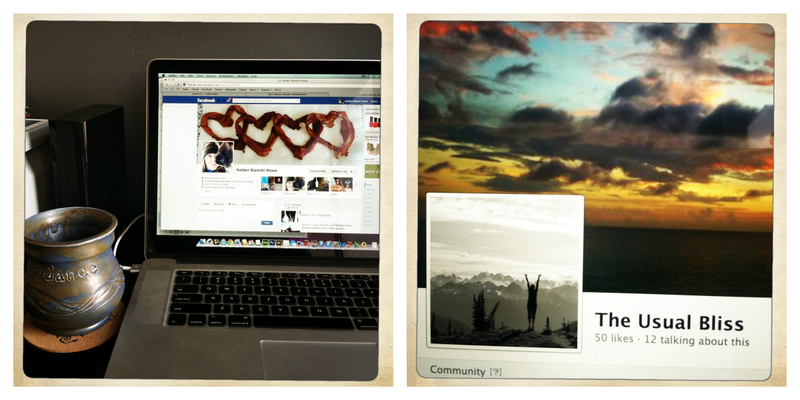 Facebook, friendships, and chicken posole. Do you even remember life without it? It’s hard to grasp how indispensible computers have become in such a short time. When I was in college, just 15 years ago, we still used the card catalog in the library and were required to take classes on Excel. By the time I graduated, the program we’d learned was already obsolete. I got my first email address in college, and it was such a novelty. Now, even my mother can’t live without email, my 5 year old niece is technologically savvy, and the majority of us take the convenience of the Internet for granted. We use it for everything, from finding that new restaurant to finding one’s birth parents. It’s been a long time since I opened the Yellow Pages. I mostly use my Maps app to get somewhere new. And do they even MAKE encyclopedias anymore? Facebook is one of the “love it or hate it” aspects of the Internet age. Considering how many people all over the world are on Facebook and use it daily, is it even possible that it’s less than 10 years old? Again, my mom is my litmus test. And she totally has a Facebook account. I know a few people who “take breaks” from Facebook to increase productivity. There are even studies that show that others’ posts can make one feel bad about their own lives! While I do feel that in daily life, it’s largely a waste of time (sometimes a lot of time), Facebook is awesome for staying in touch with friends who live far away, and for reconnecting with old friends. It’s my 20th high school reunion this year. 10 years ago, there was no Facebook, so finding classmates was tricky. This year, there’s a Facebook page dedicated to locating the class of ’93 and it’s a forum for discussion. What should we do? Where should we have the reunion? Has anyone heard from so-and-so? Incredible. Sure, I have “friends” that I probably wouldn’t recognize on the street. At the beginning, it was fun to get a friend request and think, “I remember that guy!” But I use Facebook to stay in the loop with people I actually care about and don’t get to see very often. I get to watch their kids grow. I learn about promotions or see photos of a new home. For the folks who aren’t Blog People (that’s totally a thing), I have a Facebook page set up for The Usual Bliss and it reaches people it otherwise wouldn’t. And occasionally, thanks to Facebook, an old friendship is rekindled. I’ve recently reconnected with a girlfriend from high school. She and I weren’t even in the same group of friends, really, but over the last year, through the blog and through Facebook, we’ve kind of bonded. We’ve gotten to know each other- probably more than we ever did. I learned that she loves Colorado and that, in fact, her parents live less than 2 miles from mine. What?! We’ve talked about everything, from our dogs, our jobs, our worries over having children, relationships, LIFE. While I always would have described her as “someone I know,” now I feel that she’s truly a friend. It wouldn’t have happened without the Internet. And that’s pretty cool. Recently, she sent me a note asking for a yummy soup recipe for her sick boyfriend. 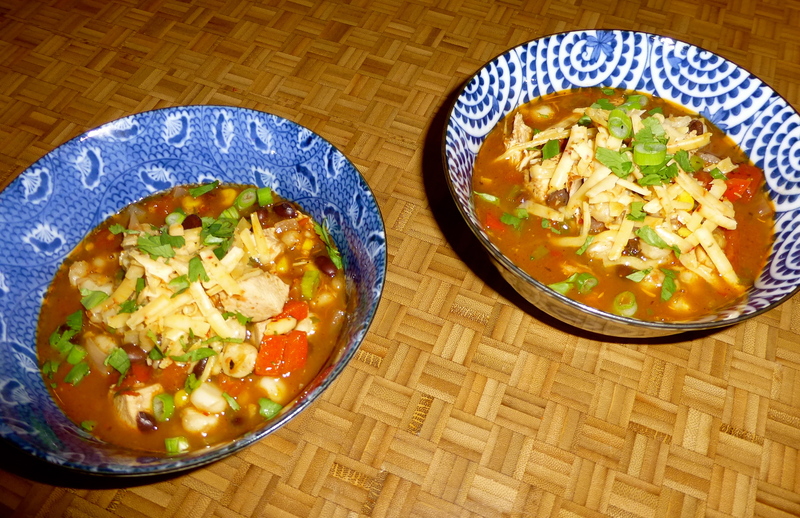 I sent her a couple of variations on chicken soup, and as I typed out the basics of my chicken posole recipe, it made me crave it! So Kerri, this one’s for you. This is one of the easiest soups ever, but it really packs a punch when it comes to flavor. I do believe that homemade everything is always better, but using premade chicken stock and a rotisserie chicken from the market makes this a perfect, minimal-effort weeknight meal. 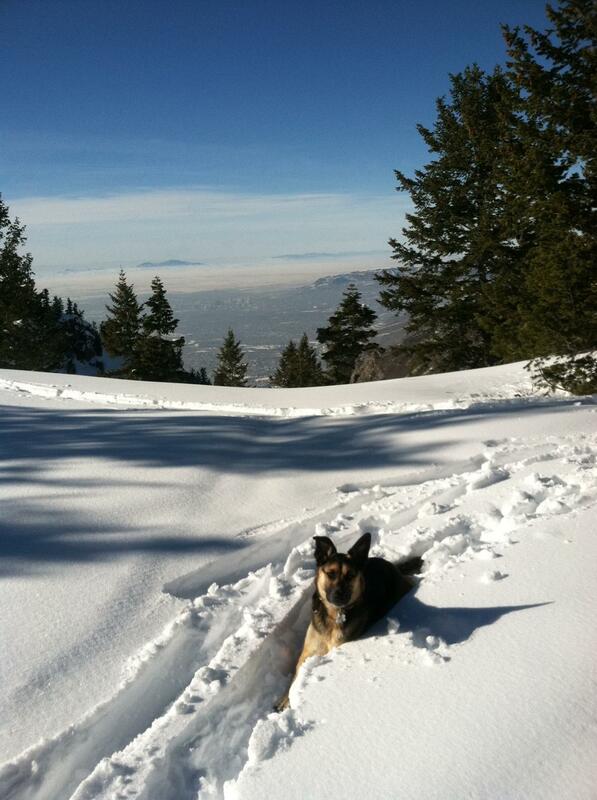 Especially after a chilly day in the Wasatch snow. 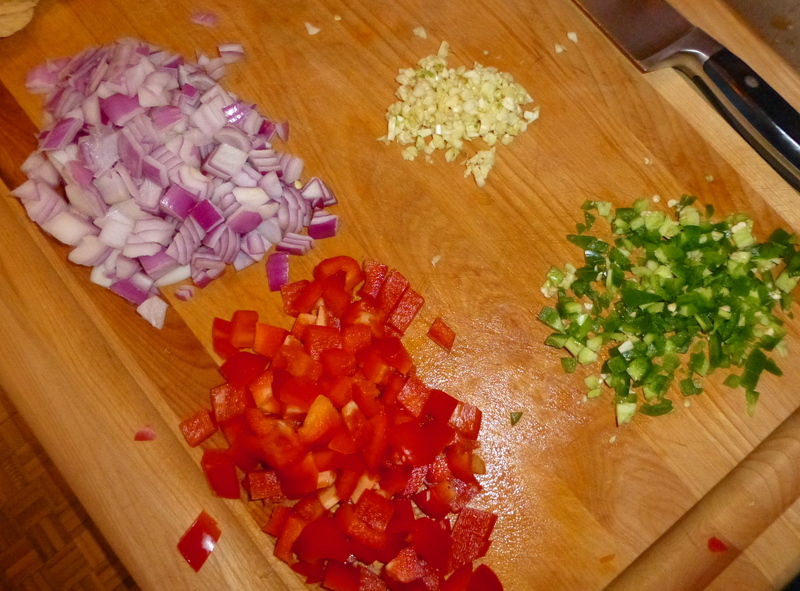 I start by chopping up the basics of any good soup: onion and garlic. A key for this soup is also a full jalapeno, seeds and all, for extra HEAT. For texture, I included a crunchy, vibrant red pepper. Not a bad start! 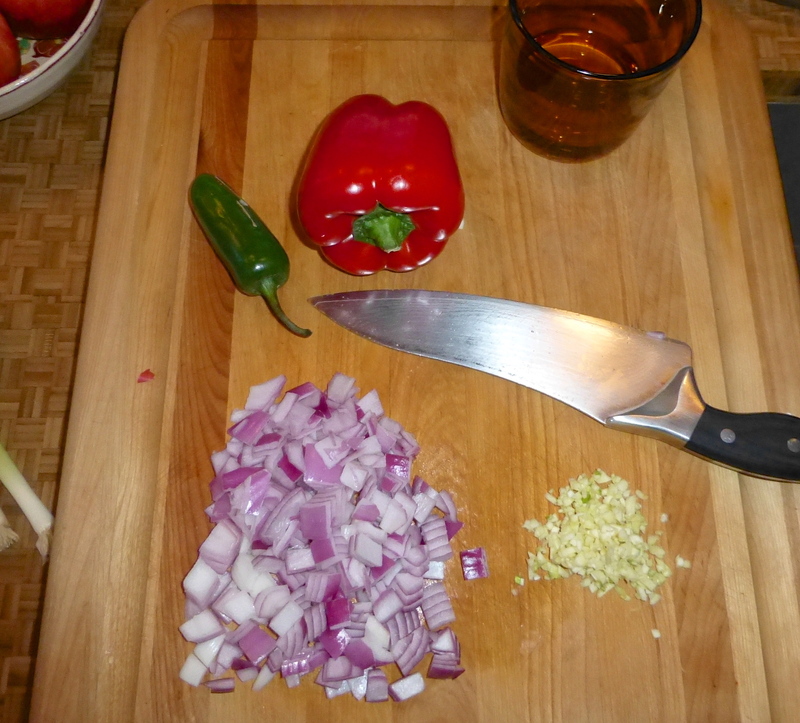 I sauté the onion and pepper in a bit of olive oil over medium heat for a bit, to soften them up. 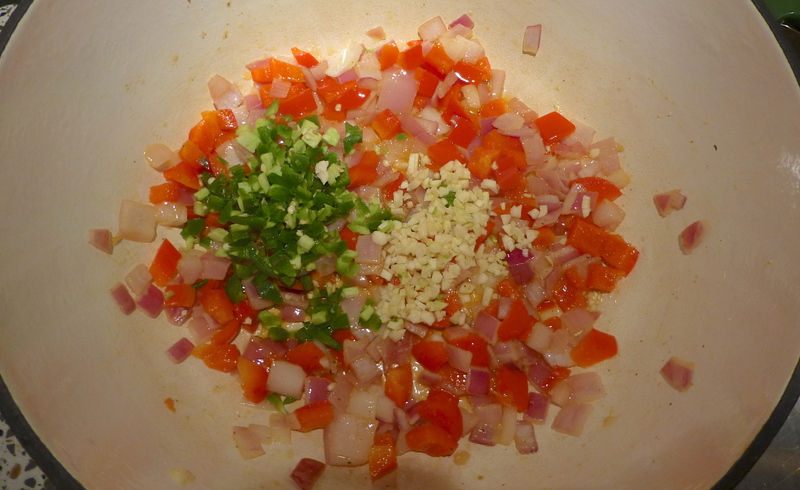 Next, I add the garlic and jalapeno. Fragrant and delicious! The seasonings are pretty basic: cumin and chili powder. 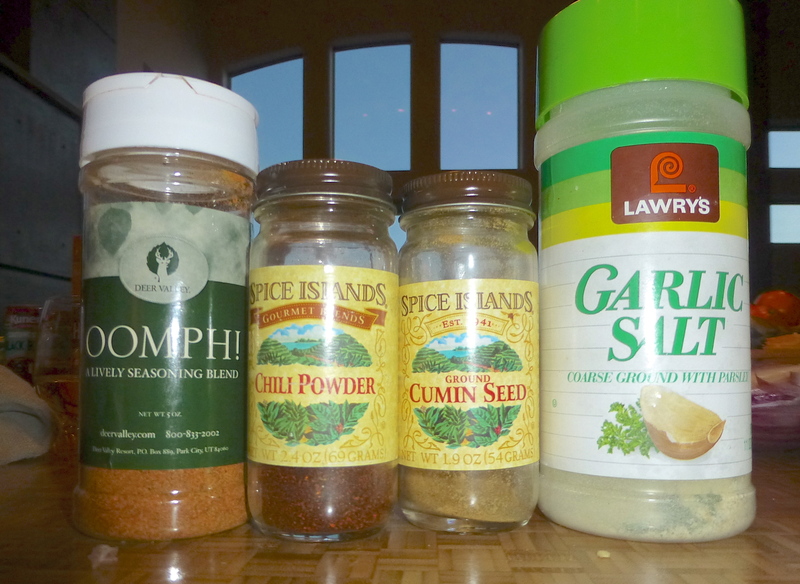 I also added some of the “Oomph” seasoning I have (a blend of Mexican spices) and my trusty garlic salt. Not pictured is crushed red pepper, which I also shook into the pot for a different kind of spicy. 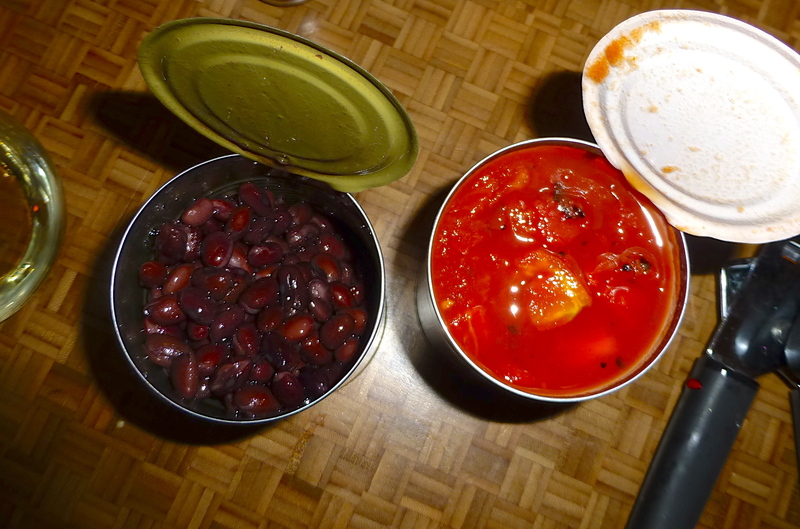 Once the veggies have cooked for a few minutes with the spices stirred in, I add a can each of fire-roasted diced tomatoes and drained black beans. 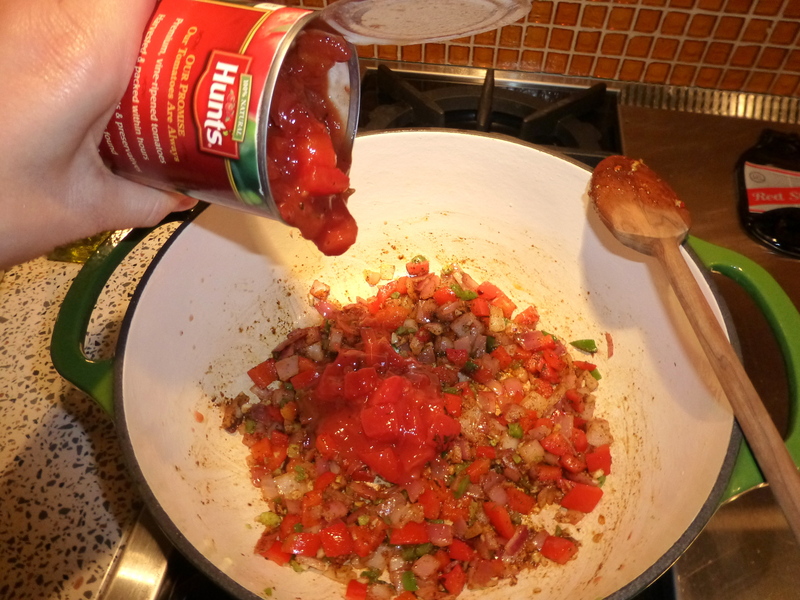 After each addition, I give the goodies a big stir and let the flavors combine before adding the next item. How easy is this? Next up is the hominy. Have you cooked with hominy before? 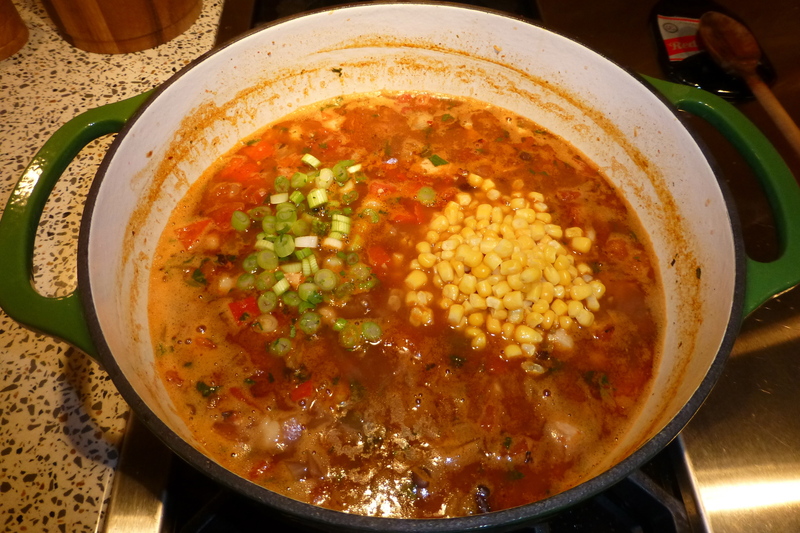 It’s kind of a soaked corn kernel and is what makes this soup posole. You can find it in the canned veggie section at the store, but I picked mine up from the Mexican food aisle. I like to add fresh herbs to any recipe, particularly when the majority of the ingredients are canned or premade. A handful of chopped cilantro and a small amount of green onions joined the party (saving a some for garnishing later). The soup doesn’t need hours on the stove. In under 30 minutes, everything has mingled enough to create deliciousness. A few minutes before serving, I add more of the fresh herbs and a handful of frozen corn. Once it’s warmed through, it’s time to serve it up! Sometimes I put a dollop of sour cream on top of each bowl of posole. 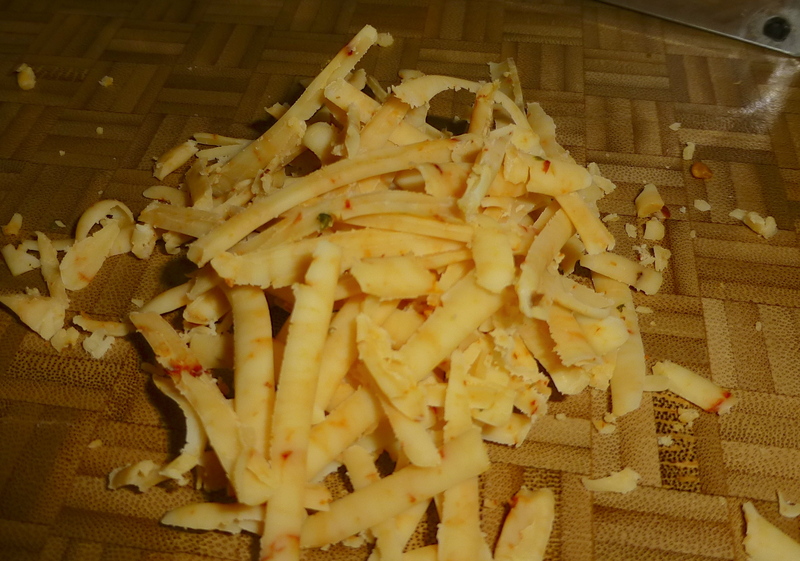 This time, I shredded some chipotle cheddar cheese I had in the fridge. A sprinkling of cilantro and green onion- SOUP’S ON. This posole is scrumptious. 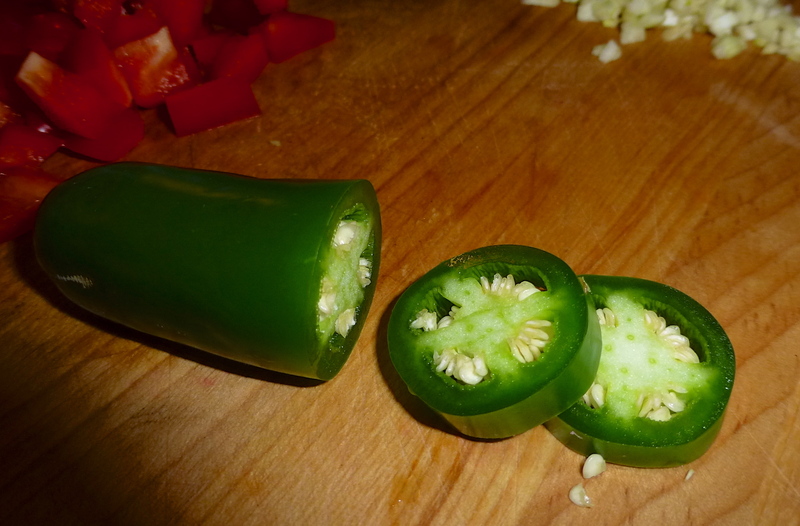 You can manage the spice level based on how HOT you like it- just reduce the amount of jalapeno or remove the seeds. 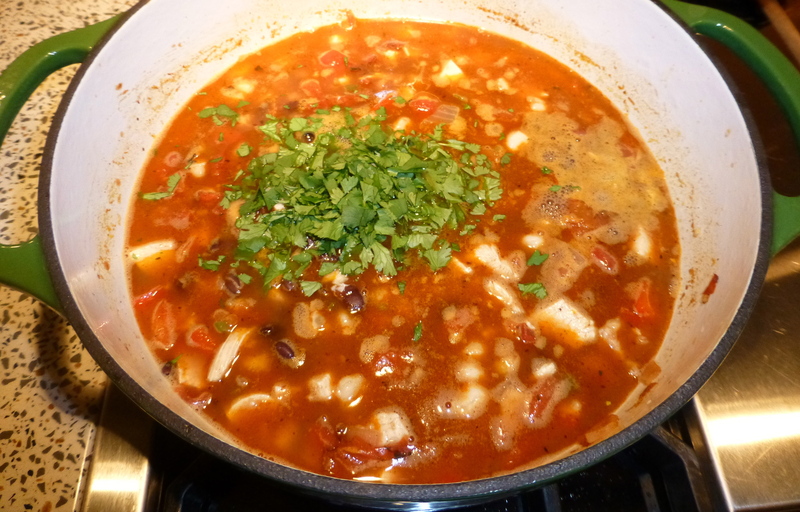 It’s chunky and filling, like a Mexican stew. 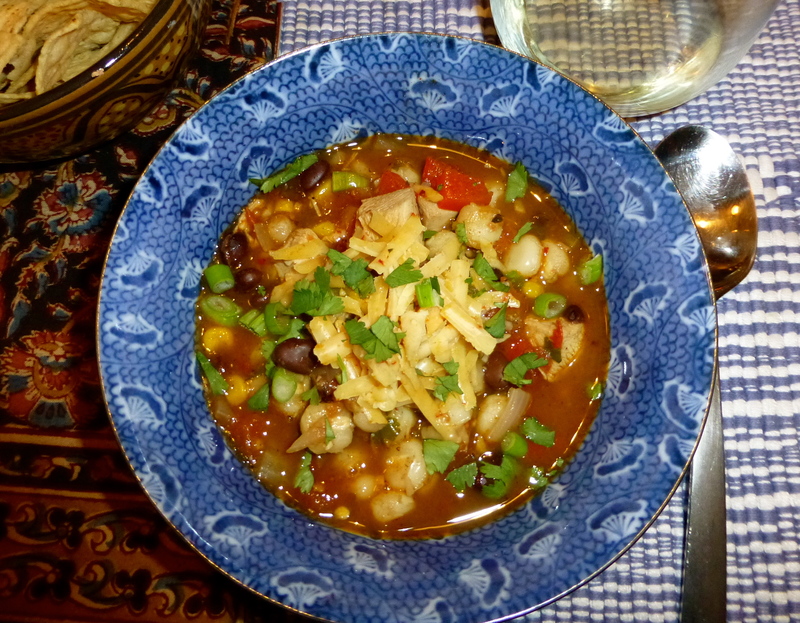 A simple tweak to the recipe and you’ve got tortilla soup– simply leave out the hominy and toss in a cup of crushed tortilla chips, being sure to top each bowl with some, too. Actually, we had a bowl of corn chips on the side with this posole, but didn’t really eat them. The posole didn’t need anything else. 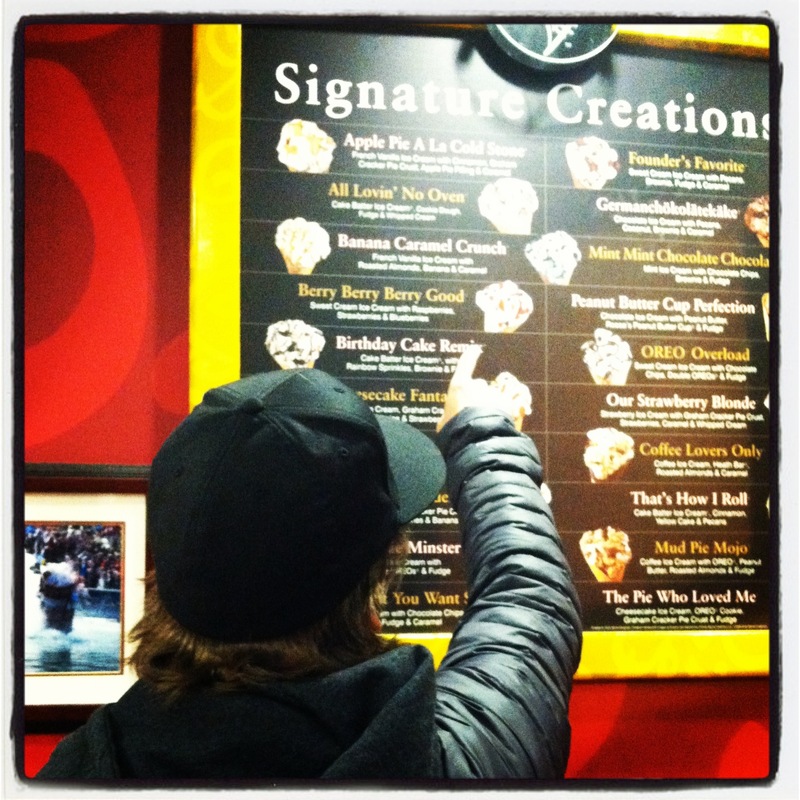 The posole warmed us up enough on the inside that we felt completely comfortable ordering big cups of frosty ice cream at Cold Stone later that night. I’m not sure if my friend made a version of my chicken soup recipe for her sick boyfriend. But it’s awesome to be able to share recipes easily- and feel friendships grow. Plus, thanks to the Internet, she’ll be able to see how tasty this soup looks! 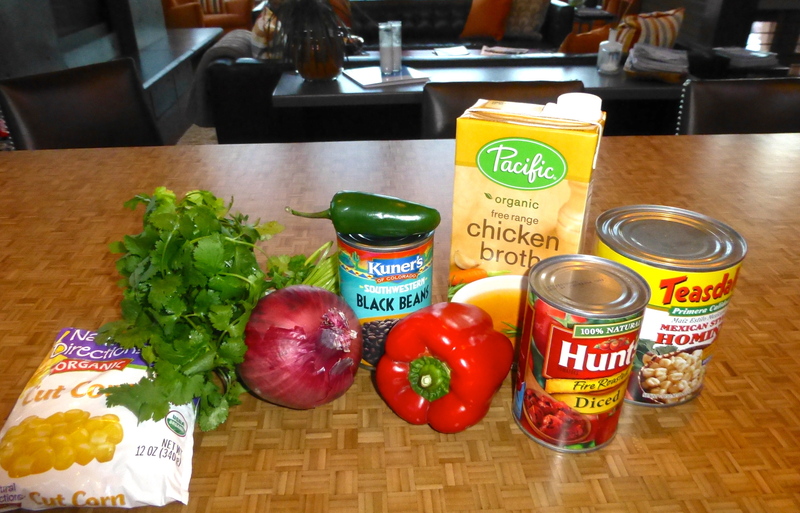 Hey, Kerri… Let me know if you make the posole. Shoot me a message- I’ll be on Facebook. Heat oil in a medium-heat soup pot. 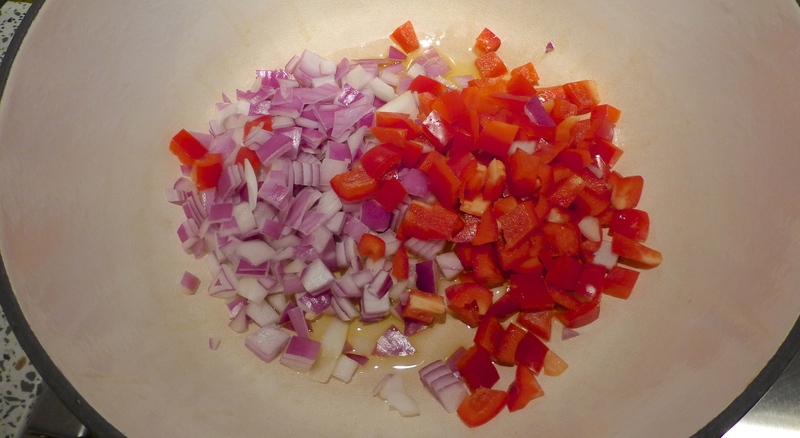 Sauté onion and red bell pepper for five minutes. 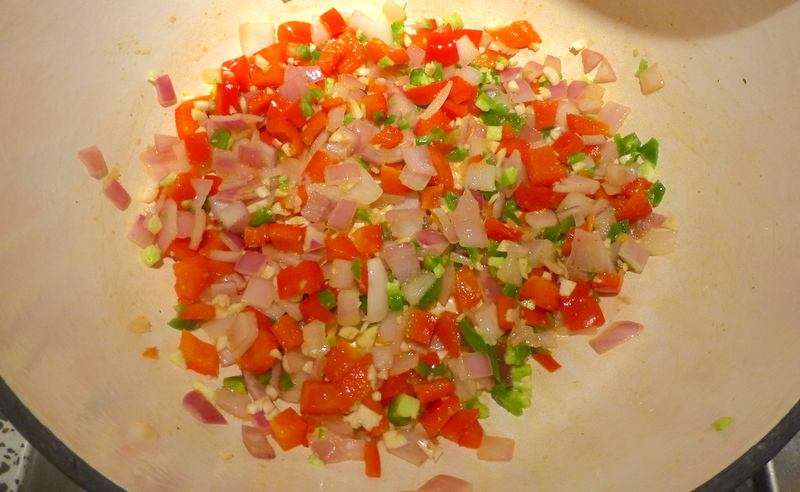 Add garlic and jalapeno and sauté for another five minutes, until veggies begin to soften. 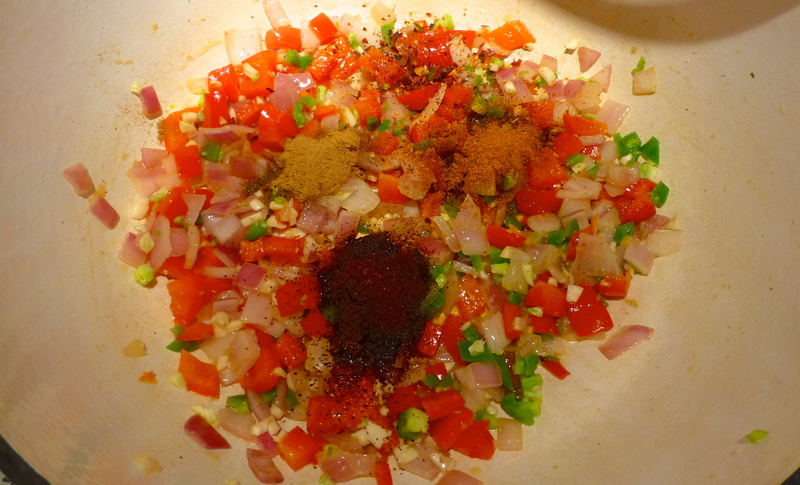 Add cumin, chili powder, garlic salt, and crushed red pepper. Stir well to combine. 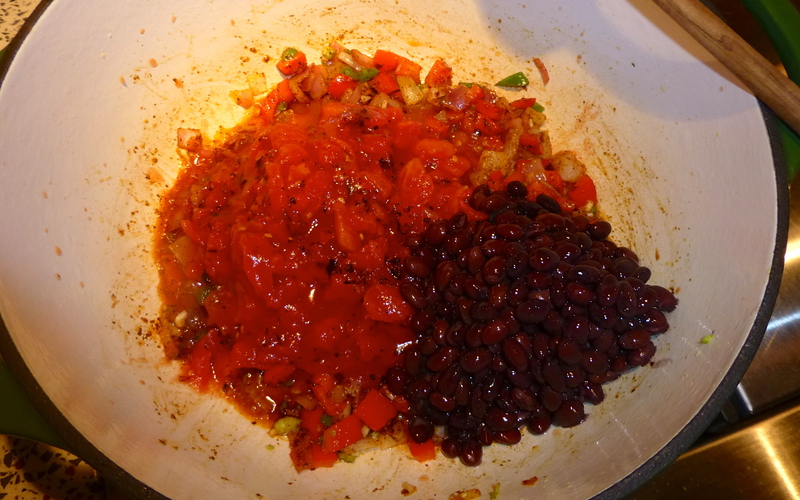 Add diced tomatoes and black beans; stir to combine. 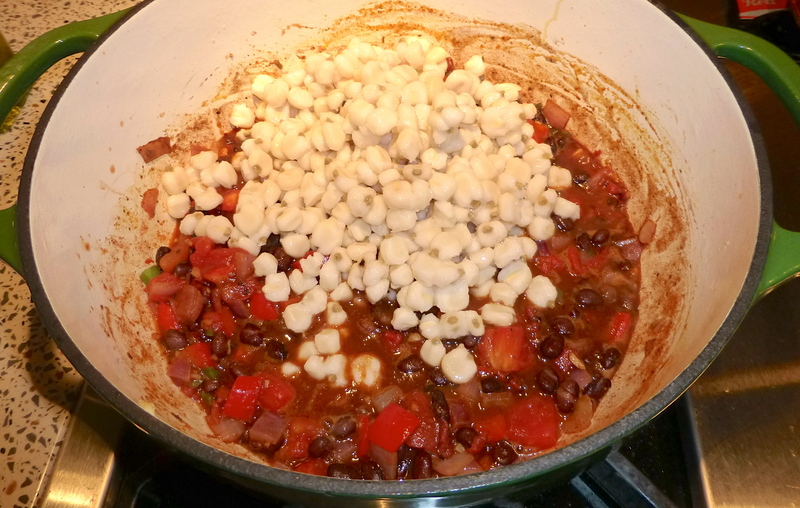 Add hominy, stir, and let cook for five minutes. 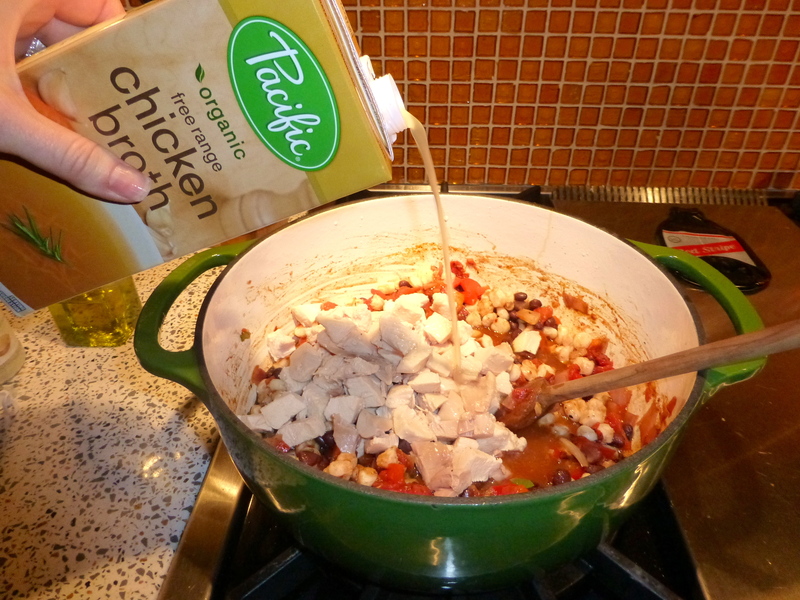 Add cooked chicken and enough chicken stock to cover the ingredients. 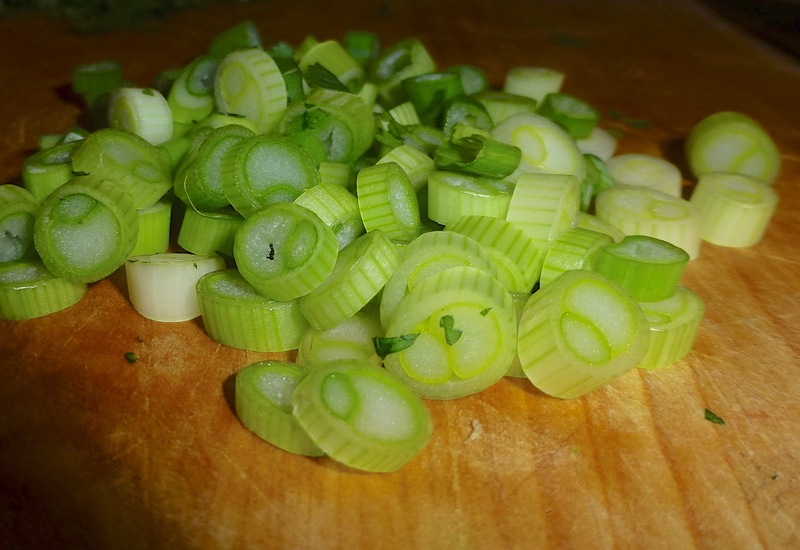 Stir in most of the cilantro and green onion, reserving a small amount for garnishing. Simmer for 30 minutes, stirring occasionally. Add frozen corn and allow to warm through. Adjust seasonings to taste. Serve with a dollop of sour cream or shredded cheddar cheese on top, in addition to reserved cilantro and green onion. 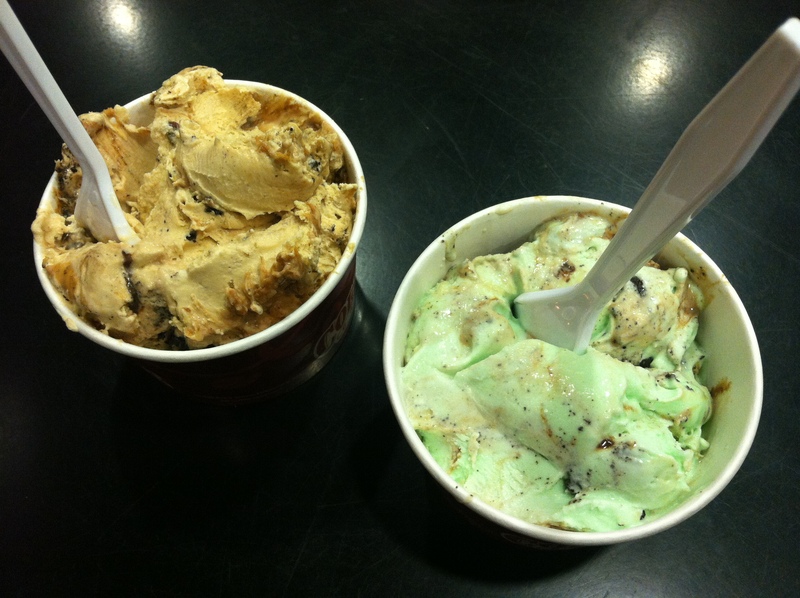 Feel free to enjoy Cold Stone ice cream after dinner. YUM! 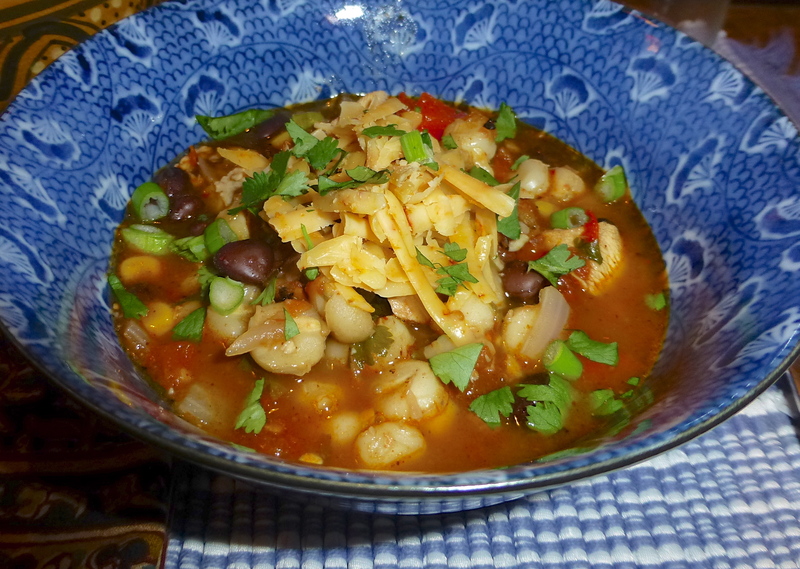 *Tortilla soup variation: Omit hominy. 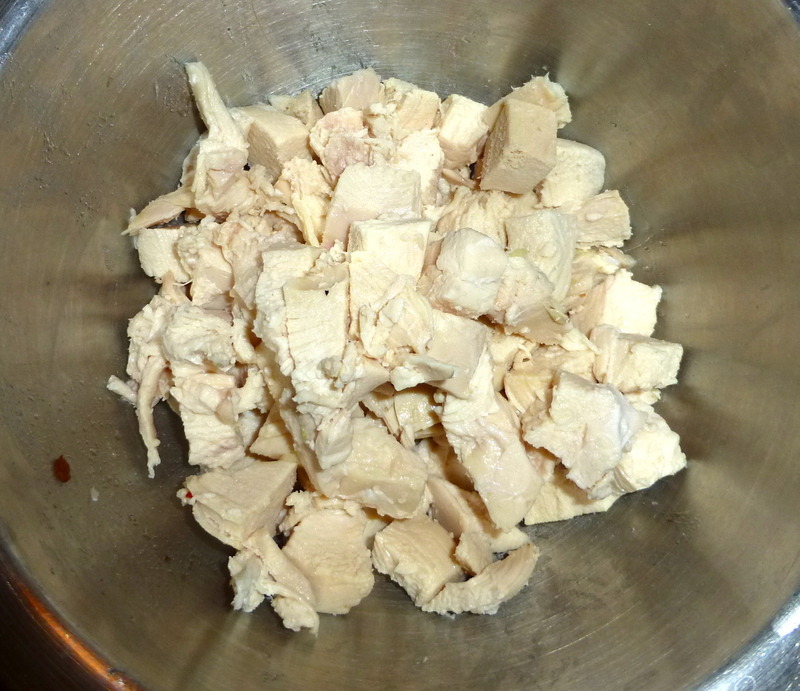 Before serving, stir 1 cup of crushed tortilla chips into the soup. Top with more tortillas before serving. Remember that every recipe and culinary adventure is featured on my FOOD BLISS link above! Next postDeja-view: Summit Park smiles. 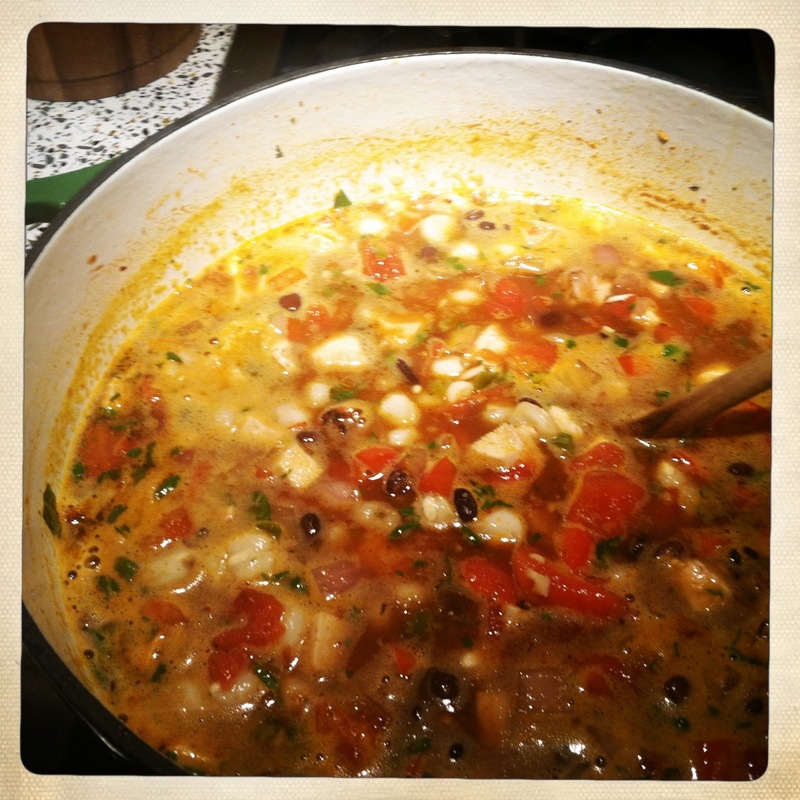 John and I love a good posole… we’re so trying your recipe! I think this is sort of a shortcut version, but it sure tasted great! Shortcuts are OK by me, it’s the taste that matters! The internet is absolutely ridiculous. It’s amazing how social media lets us connect with people everywhere, funnel our interests into meaningful conversations with people we’ve never met, etc. The recipes, photographs, true stories and zillions of other things I’ve found through blogging/Google never cease to amaze me. It rocks. The blogging community is a great example of connecting through the internet in ways that would be impossible otherwise! Yes! I am so, so thankful for the people I’ve “met” through twitter and blogging! That’s awesome! There are a lot of good uses for networking!! Yum! 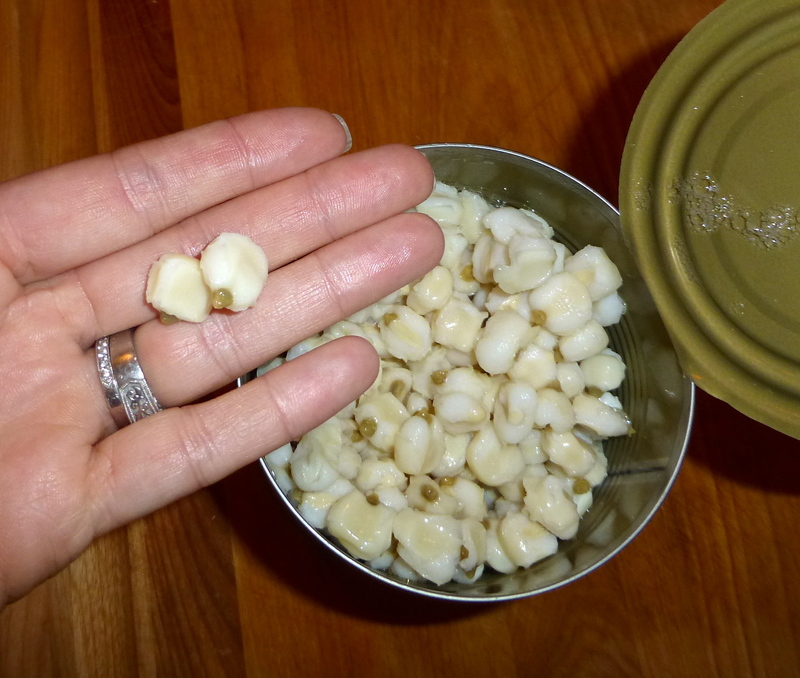 Bought a can of hominy recently after reading about it in the Pioneer Woman cookbook. I was a little nervous to add it to the soup recipe- does it taste like corn? Wasn’t sure if my kids would see it in their soup and give me the dreaded “YUCK! What’s that!!”. I don’t think it tastes much like corn, honestly. Almost like POPCORN- more nutty and the texture is definitely different. You may have to just open the can and taste a piece! Thank goodness for the WordPress search feature. I have leftover bbq’d chicken and I knew you had posted this recipe at some point. Thank you for what is sure to be a fabulous dinner!